What is a planer used for? It is quite hard to settle on the best benchtop planer. Mainly because we all have different budgets and thickness needs. So to ensure I cover everyone, I felt it was essential to consider a wide range of features and models. This guide will help you make a well-informed decision as you pick a planer for your woodworking needs. Nonetheless, there is one thing we can all agree on. The best benchtop planer is crucial if you’re a seasoned carpenter or woodworker. Having said that, I would like to clear up on a misunderstanding before proceeding. You’ve come across lots of sources claiming a benchtop planer is not as powerful as a heavy-duty thickness planer. And that’s true. But why blow thousands of dollars on a heavy duty machine when a smaller one can do the task just as fine. Better yet, unlike a heavy duty planer, benchtop planers are portable. And this is equally important. Let me start with this long-lasting and highly rated thickness planer. DEWALT DW735X’s three-knife cutter head delivers extremely impressive results. It also comes with a 20,000 Rotation per Minute(RPM) motor. Thanks to the two-speed gearbox, this woodworking appliance will allow you to change the speed to optimize the cuts. The maximum depth for cuts is 1/8”. The Appliance’s full capacity is 13 inches in width and 6 inches in depth. The only downside to this machinery is its weight. Most individuals have reported it’s quite tough to lift. That’s why DEWALT is most recommended for heavy users. It works better for a stationary workshop. Back to the positive note. The Dewalt planer comes with a three-year warranty and guaranteed customer satisfaction. Don’t take my word for it. Head over to Amazon and check out its reviews from verified purchases. 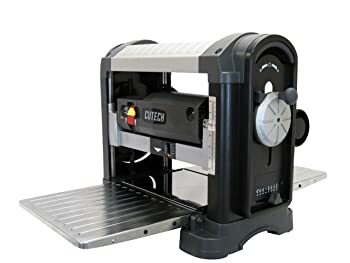 While it is among the most expensive in this review, Cutech 40200H-CT is fairly priced given its durability and sturdiness. In fact, in terms of performance, I can compare this stroke of genius to some of the most expensive models on the market. The benchtop planer delivers smooth surfaces for any sort of lumber. Having said that, after multiple uses, Cutech 40200H-CT failed to deliver the optimal evenness when it came to hardwoods. I had to use a sandpaper to attain that optimum level of evenness. Other than that, the benchtop planers head is easy to work with. And maintenance, as well as cleaning, are simple to do except for some of the light oil on its cutter heads. Also on my list is this high-end product from Porter Cable. If you are looking for a benchtop planer that will not break the bank, then you should check out this masterpiece. 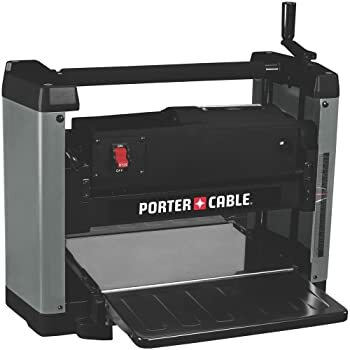 While the name Porter Cable is not famous in the woodworking industry, I guarantee you will love the results this appliance delivers. For starters, it boasts a variable speed that allows you to decide how quickly you would like to work. If you wish, you could start out at 5,000 RPM and slowly increase the speed up to the maximum 8,000 RPM. The planer is guaranteed to leave a consistent and smooth finish across your lumber’s entire length. It also includes a dust collection system to help you keep your workstation clean at all times. Lastly, Porter Cable PC305TP also retails with two knives in its cutting area. You can easily remove them for replacements or adjustments. The Makita 2012NB is around ½” smaller than both the WEN 6550T and the Dewalt. However, it’s certainly a step up in both performance and quality over the two tools. 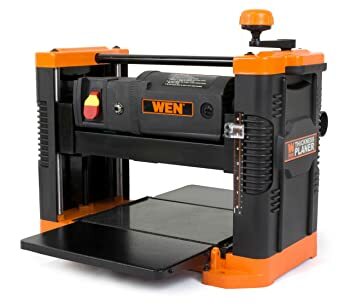 Better yet, this is by far the noiseless benchtop planer you will ever find. It only produces 83 decibels, to be exact. In addition, you will have a hard time finding a benchtop planer that can deliver more reliable and better cuts than the Makita2012NB. Unless you’re willing to sacrifice thousands of dollars. This planer accepts lumber of up to 6 3/32” thick and 12” wide. The infeed and outfeed tables also provide sufficient support for long boards of up to 2×10. If you’re also the kind of person who likes to consider customer reviews before buying, I urge you to check out Makita 2012. You’ll find that this machinery is top rated in most, if not all, retail sites. Its only downside is its price tag. I’m sure you’re familiar with the Chinese product’s stereotype out there. Where you’re advised against acquiring low quality, cheap, and imported Chinese products. That said, WEN 6550T clearly defies this widespread belief. It is one of the most affordable, yet best performing benchtop planer I have ever come across. Better yet, it boasts great customer review and lots of 5 stars on Amazon. 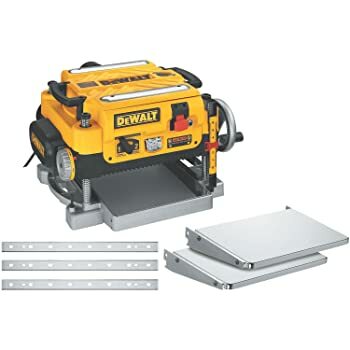 Just like the Dewalt I reviewed earlier, WEN 6550T is a 15 amp, 12.5” benchtop planer that you can adjust to plane up to 3/32” with each pass. The motor delivers approximately 18,800 cuts per minute. This means it is not as efficient as the Dewalt. But of course, we expect that given the product’s huge price difference. WEN 6550T can accept lumber of up to 6” thick and 12.5” wide, and also includes a dust collection space that works well. A benchtop planer can execute many tasks, but its main role is to adjust a lumber’s thickness. If you acquire wood from a lumber yard, most (if not all) of it will be in rough conditions. In order to straighten it all out, you will need the best benchtop planer out there. For instance, let us say you need a 1/2” lumber but the yard delivers timber pieces measuring something like 2/2. If you have a benchtop planer, you can simply bring the pieces home and plane them down to whatever thickness you desire. As an alternative, you could ask the lumber yard to do it for you if they have a planer. But take into account that this will cost you extra hundreds of dollars. You can also use a benchtop planer to do edge to edge glue ups. You can take 2 pieces of lumber that are a little thicker, say 4/4”, glue them together, then plane them down to your desired 3/4”. This awards you a nice solid surface. Before you set out on a quest of finding the best planer, it is crucial to know which one will best suit your needs. With that consideration in mind, I decided to include a rundown of the key types. A manual hand planer is a plane that’s powered up purely by its user’s hand movement, i.e. you need to run the blade over the piece of lumber you are working on. Manual hand planes are also the lightest and smallest of the wood plane tools. Various types include block planers, smooth planers, and jack planers. In addition, manual hand planers make less noise, cost less money, and do not need a power source. A power hand planer is either a battery operated cordless planer or an electric hand planer that is corded. Since they’re powered, they save lots of effort and time compared to manual hand planers. Even better, they are better able to thickness-cut different types of wood that a manual hand planer would have trouble working on. Power hand planers can either be curved based or straight based. As you may already know, a benchtop planer is an appliance that rests on benchtops and planes boards of lumber of different lengths and widths. 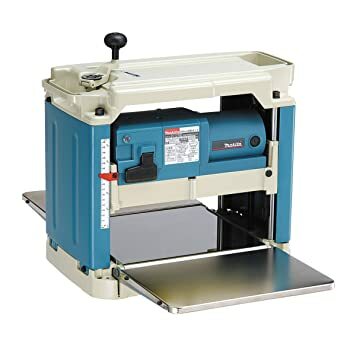 Standard size benchtop planers come with 6-inch cutter heads. In addition to a cutter head, they come with a fence to reference the boards and tables on either side. A benchtop planer is lighter compared to a stationary planer. Stationary planers are defined as benchtop planers on steroids. However, note that they can also plane boards of lumber of different lengths and widths. A stationary planer uses its own base to stand free. This implies it does not need a bench to be set up on. Furthermore, they are much heavier, bigger, and more expensive compared to benchtop planers. A jointer planer is exactly what it sounds like. a combination of two different tools. Even though this equipment is primarily designed to work as a planer, rest assured it will also impress you as a jointer. Given it can execute two distinct tasks, a jointer planer can help you save space around your workshop. A benchtop planer has a cutting surface and knives situated on the base of the tool. As you set up the equipment, you will need to use the knobs situated at the top. They look like screws and they allow you to adjust the planer’s cutting depth. Once the tool is ready to start working, you will need to place your lumber flat on the table before switching on the power. Some benchtop planers have green buttons or switches to turn on the tool. Others only come with a knob you can turn in a certain direction to switch it on. You will then have to apply a little pressure in order to push the lumber through under the knives. A planer comes with extension tables that ensure you make shallow and even cuts which are one level. This is regardless of whether the table itself is quite small. The best benchtop planers will also retail with a knob you can use as a safety stop to bring the planer’s motor to a stop. Most planers (whether benchtop or handheld) came with a gauge that will show just how much wood will be trimmed with every pass. This means the gauge will help you make sure you do not take off too much from your piece of lumber. Without a gauge, you could end up executing a deeper snipe or tear-out. Also, ensure the planer you choose comes with an adjustable depth stop. This will ensure you do not plane a board that’ll be thinner than your desired thickness. Given a benchtop planer is a semi-automatic woodworking appliance, there is going to be lots of sawdust produced. The machine will also generate a lot of chips and dust. This can create too big of a mess in your space. Fortunately for you, most benchtop planers in the marketplace today retail with a dust collection system. This feature keeps your workstation as neat and as clean as possible. Before you invest your hard earned dollars in the equipment, at least see it in action. I understand that most woodworking appliances are noisy. But ensure the planer you pick is not too noisy, as that will, without a doubt, bother your neighbors. The good news is a benchtop planer makes less noise compared to most types discussed up there. Power is an essential element when choosing any sort of appliance. However, it is not considered the most critical aspect of a woodworking machine. Either way, make sure you pick a benchtop planer that can handle nice levels of cuts without chocking on you. As a carpenter, your aim should be to learn how to take full advantage of the best benchtop planers. Once you do, you can easily refurbish uneven and worn out pieces of lumber and make them look brand new. Moreover, ensure you do your homework before investing a dollar in a planer. Going by the design and your gut alone won’t help you out in this situation. You need to make an informed choice that aligns with your needs and requirements.